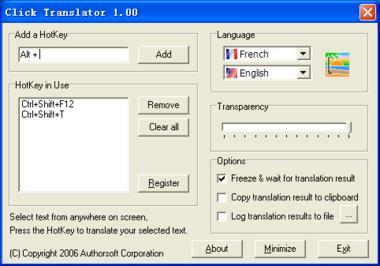 Translate text from anywhere on screen with a single mouse select and a key press! 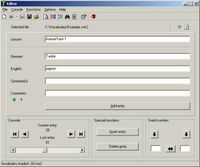 Click Translator is a tool that provides instant translation of your selected text in 53 major languages, English, French, German, Italian, Spanish, Portuguese, Dutch, Greek, Russian, Japanese, Korean, Simplified Chinese, Traditional Chinese, Hungarian, Danish, Dutch, Finnish, Swedish, Arabic, Catalan, Croatian, Czech, Hebrew, Norwegian, Afrikaans, Albanian, Belarusian, Bulgarian, Estonian, Filipino, Galician, Haitian, Hindi, Icelandic, Indonesian, Irish, Latvian, Lithuanian, Macedonian, Malay, Maltese, Persian, Polish, Romanian, Serbian, Slovak, Slovenian, Swahili, Thai, Turkish, Ukrainian, Vietnamese, Welsh, and Yiddish. All you have to do is to select text from anywhere on screen and with one keystroke you will get its translation in a balloon message. 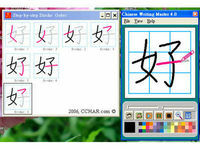 Click Translator removes language barriers across the World Wide Web and enables you to communicate in different languages with ease. 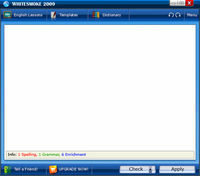 The software works with Windows 32-bit and 64-bit.